Don Wilcox (Class of ’47) found his true calling after his university experience, but the United Kingdom native never forgot his days at the University of New Brunswick – both as a student and then through his interaction with campus officials as a businessman. Those fond recollections, coupled with his desire to salute the memory of his wife, led Don to create the Rosemary Wilcox Memorial Scholarship in Earth Sciences at UNB with a $125,000 donation. Don became familiar with adversity at an early age. His family immigrated to Canada from Cardiff, Wales, in 1931 when he was six, settling first in Montreal, then Ottawa. After a return visit to the United Kingdom, Don and his mother set sail for Canada from Liverpool on September 2, 1939, the day before Great Britain declared war on Germany. Only hours after the war was declared, their ship, the Athenia, was torpedoed. Don and his mother were rescued and returned to Cardiff until May of the following year, when their passage to Canada was finally successful. After Don completed high school, he attended UNB, first in geology, then forestry and finally biology, but because he was colour blind, he could not develop his skill set in those professions. He never gave up on education, however, returning to Europe, specifically Ireland, to study at Queens’s University Belfast in 1957. That’s where he met and fell in love with Rosemary. 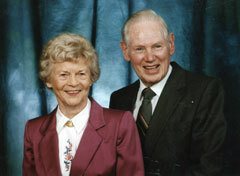 They married a short time later and returned to Canada in 1961, eventually settling in the Halifax area. In spite of life’s challenges, Don drew on the positives of his life experiences and education to develop a thriving sales career, where his easy-going manner and engaging personality became valuable strengths for Philips Electronics. Now retired, he shares his life-changing experience aboard the Athenia with visitors to the HMCS Sackville in Halifax. Don has always held high regard for UNB, a special setting that remains close to his heart. The Rosemary A. Wilcox Memorial Scholarship in Earth Sciences will be awarded to a Fredericton campus student who has completed the second year of the bachelor of science program and has declared a major in earth sciences. Colin Padget of Fredericton is the inaugural recipient of the award.